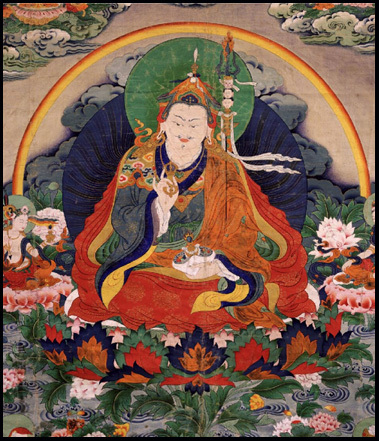 Prayer to Guru Rinpoche, called "Guru Rinpoche, inseparable from me"
This utterance, liberation upon hearing, breaks the bonds of that which restricts us, in a hidden way. Guru Rinpoche, inseparable from me. The above short prayer is from the “Primordial Space of Samantabhadra” treasure cycle and is part of the “liberation through hearing” utterances. It is an extremely special and powerful method of resting the mind in it’s natural state, and carries the unfailing blessing of our father, Guru Rinpoche. It doesn’t need repetitions, and can be practiced by anyone, anywhere. Just say the words softly and relax. Don’t try to analyze at all, or look for logic. It is said that the superior vessel will connect immediately. The middle one will know his own limitation and will swiftly overcome it. The lesser one at first may not feel much, but the blessings will come, as samaya is unfailing.